Available in 40 mm to 250 mm (11/2 inch to 10 inches) ID & in 3 metre lengths. There are 2 types of Casing Pipes: CS & CM. 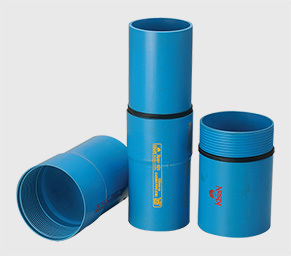 The CS Pipes are Casing Pipes suitable for wells with depths upto 80 m while the CM Pipes for wells with depth above 80 m up to 250 m.
Borewell : KML Classic Casing Pipes are used to protect the Submersible Pipes that convey underground water to the surface. Strong and hence the chances of wall collapse are very remote.